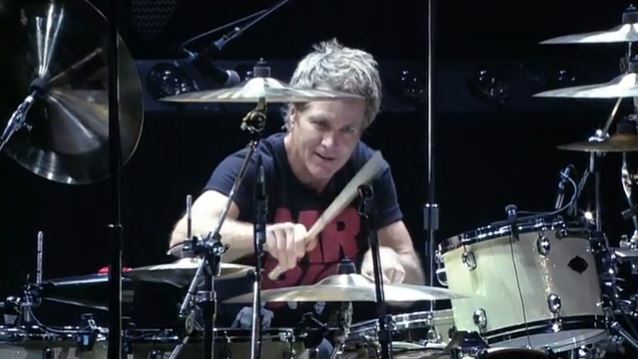 MR. BIG drummer Pat Torpey has been diagnosed with Parkinson's disease and will be unable to perform all of his normal drumming duties on the band's upcoming world tour in support of the group's new album, "...The Stories We Could Tell". "I've been dealing with Parkinson's symptoms for the past couple of years and only recently received a confirmed diagnosis as symptoms worsened," Torpey said. "I intend to fight the disease with same intensity and tenacity that I drum and live my life by and will continue recording and performing, as always, to the best of my ability." MR. BIG will announce a replacement drummer who will sit behind the kit for the band's fall 2014 tour. Torpey, 54, is expected to join his MR. BIG bandmates for select tracks as well as participate in the group's acoustic set. Parkinson's disease is a degenerative disorder of the central nervous system. There is no cure for Parkinson's disease, but medications, surgery and multidisciplinary management can provide relief from the symptoms. Asked in a 2011 interview with OnlineDrummer.com what influenced him to pick up a pair of sticks and start drumming, Torpey said: "I was about 7 or 8 years old, and my family used to go to this local picnic event with a live polka band. I was able to sit behind them and look down on the drummer, right on the top of him, and so from that vantage point I could see what he was doing, and I thought, 'Wow, that looks like fun!' That was my first memory of when I can remember wanting to play the drums. I went to my mother and said, 'I wanna play the drums,' and she gave me that look that parents give you, you know the 'Oh, yeah, sure you do… you're 7 years old.' So from there I kind of held on to that dream. I'd fashioned some drum sticks from a couple of sticks out of the yard. I carved them and drew my name on them with a magic marker, you know, the kind of thing an aspiring kid would do." "...The Stories We Could Tell" will be released in September via Frontiers Records. The CD's first single will be made available later this summer. MR. BIG's last album, "What If…", was released in Europe in January 2011 via Frontiers Records. The North American release, also on Frontiers Records, followed in February 2011. "What If…" was MR. BIG's first "all-original" album since the reunion of the four original members, Eric Martin, Paul Gilbert, Billy Sheehan and Pat Torpey, back in early 2009. Sixteen years after the release of "Hey Man", the new recording was produced by Kevin Shirley (AEROSMITH, RUSH, IRON MAIDEN). Formed in 1988, MR. BIG forged its place in hard rock history by combining trademark "shredding" musicianship with awesome vocal harmonies. The original lineup produced numerous hit songs that ranged across a wide array of rock genres, be it ballads, heavy metal, or blues rock. Their hits included "To Be With You" (Billboard Hot 100 number one single in 15 countries for weeks, in 1991, propelling the band the band to huge international success and record sales in the multi-millions), "Wild World", "Green-Tinted Sixties Mind", "Just Take My Heart", and a host of heavy metal songs that were played mostly during their live performances: "Daddy, Brother, Lover, Little Boy", "Addicted to that Rush", "Colorado Bulldog", and "Take Cover".